Some instructors share videos, documents, and forms from their UAlberta google documents domain with their students through eClass courses. 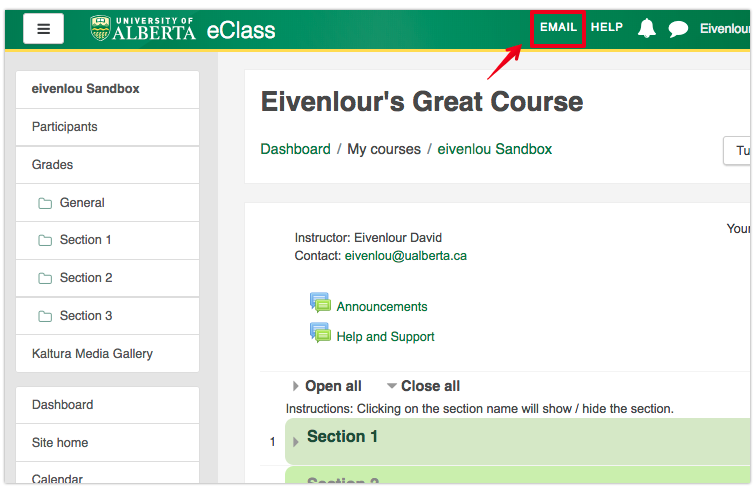 This article will explain how to view UAlberta Google Drive content on eClass when it does not display properly. A change to the Google authentication method has meant that in order to access content from Google Drive on eClass, you need to explicitly sign into the UAlberta google apps (mail/drive) on the same browser with your CCID. If users do not log onto google apps with their CCID, then the content will not display and videos embedded from Google drive will not play. 1. The top navigating bar of your eClass contains a navigation link directly to your email. Clicking on the email link will open a new tab and sign you into your UAlberta Gmail account. 2. Go back to the eClass page that has the Google Drive content and refresh the page. The content should now display correctly.